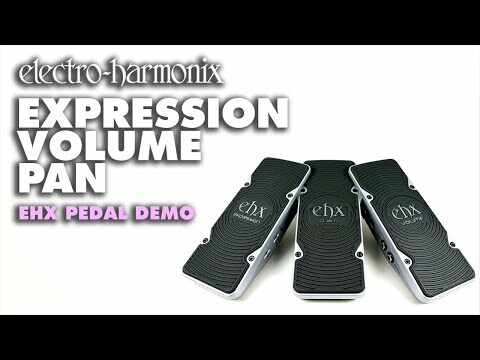 The Electro Harmonix Next Step Volume Guitar Effects Pedal is designed to guarantee seamless freedom of movement using motion sensor technology rather than relying on moving parts. By eliminating pots, switches and gears, you are afforded a highly responsive level of signal control. By including a volume pedal in your setup, you can create gorgeous tonal swells when combined with your delay or reverb pedal. You have total mastery over your rhythm and lead tone to create some truly mind-blowing live performances. The Volume pedal has a single input and two possible outputs: Out (bypass) and Direct Out. The Bypass Volume control dial dictates the output volume when the pedal is in bypass mode, which gets louder as the dial is increased. The Direct Out jack is a buffered version of the input signal that is unaffected by the position of the Bypass Volume dial, making it the ideal choice for sending a signal feed to a tuner or to split the input signal to a separate part of your pedalboard setup. Utilising motion sensor technology enables EHX to create the seamless signal control within the Volume pedal. The single chassis design features a wedge on one side, which allows the unit to be rocked back and forth to attenuate the volume level. Calibrating the pedal is easy, and within seconds you'll up and running - perfect for tailoring your gear to any performance environment with minimum effort. As we've come to expect from the team at Electro Harmonix, the unit is rock solid. Whether it is primarily for practising with at home, studio use, or taking on the road, you can rest assured that this faithful little unit will be with you every step of the way. All you need to keep it powered up and running is a 9V battery or power supply unit (optional).